When I first read this issue, I was a little turned off. I guess I expected more from the first issue of McDuffie’s run and I certainly expected better art. But now I think this was a pretty good read and did remind me a lot of the TV show. Good start, and at least much better then anything Meltzer did on this title. 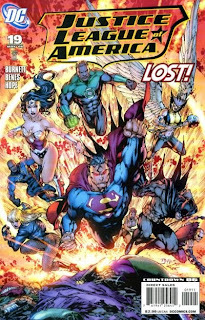 I think the Injustice League is very cool and I like how they are opposite numbers of the League. Of the villains we have seen so far this is what the breakdown is. 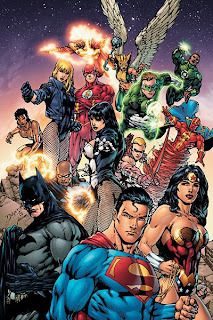 Black Canary, Vixen, Black Lightning, Red Arrow, Geo-Force, and Red Tornado are sadly without any villains yet. This is another good issue. 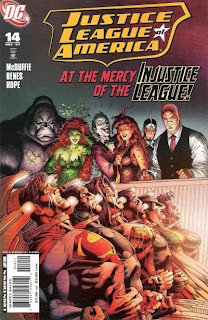 The Injustice League is shown to have Cheshire and Shaggy Man in it’s ranks as well. Cheshire is a Red Arrow villain arguably (even if he has a kid with her) but Shaggy Man and Dr. Light are just general villains not specific to anyone. The way Batman basically tells Firestorm that he has no choice, he has to join the Justice League was awesome! 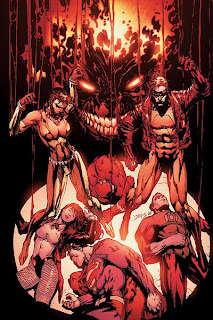 This concluded the Injustice League arc and it was good, but this arc as a whole would have been a whole lot better if someone else was doing the art. Eh….this issue was okay. It just served as a preview to two other mini-series’s which is kind of annoying. I would have rather had a story in this series that starts and ends in it. Haha the main story I could care less about. It was lame and had awful art. 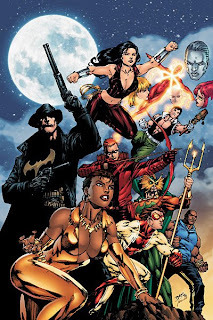 But the back up written by McDuffie was good because McDuffie comments on the fact that Meltzer’s whole Vixen is using the powers of the Justice League thing makes no sense. I love it! Take that Meltzer! Meh….this was very decompressed and was basically filler. They could have cut this entire issue of the arc. But the back up was good. the Outsiders. Instead, he just dissappears. That’s bad editing. This was by far the best issue of McDuffie’s run so far. 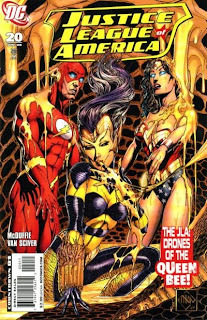 And you wanna know why, Ethan Van Sciver. 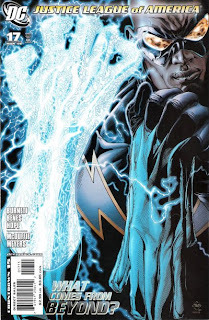 Look at how much of a difference Ed Benes’s art makes with McDuffie’s writing. 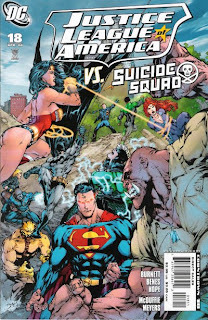 McDuffie is a good writer, but Benes’s art is soo bad that it is killing a good story. Anyways, this was a beautiful issue with a nice story with the Flash and Wonder Woman. I liked it a lot. This is a final crisis tie-in issue that is rather enjoyable. In fact, it was just as good as last issue. This book is sooo much better without Ed Benes. Please DC, get rid of him! 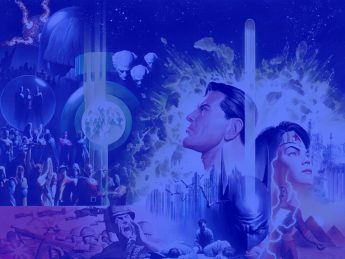 Anyways, it made me happy to see that Superman, Batman, and Wonder Woman were going to add Martian Manhunter back in the league before he died but the trinity is acting kind’ve elitist. Libra is a visually stunning character and I can’t wait to learn more about him in Final Crisis. Unfortunately Bene is back this issue….with some ultra terrible art. He draws just one body type…it’s so annoying. Plot-wise, it was only okay. Red Tornado taken over by Amazo does NOT interest me, especially when the League already fought Amazo under Meltzer’s pen. The vixen subplot interests me more but not by much. I really can’t reccomend this issue. 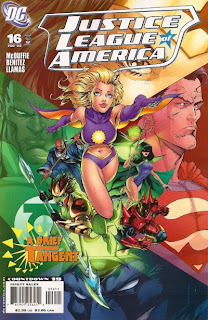 While this may have not been a horrible issue if Ed Benes was not doing the art, it was horrible when comined with the art and the rather dull fight with Amazo that lasted the entire issue. Damn. And this series was finally getting good again. Yay! Benes is gone again this issue. 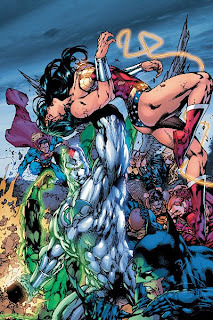 This made the fight with Amazo so much better but still rather dull. 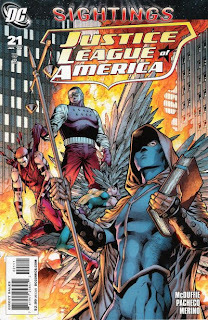 The best moments of this issue were at the end where they go to meet Animal Man. I did not even think of the vegatarian thing. I am intrugued as to where this is going. This anniversary issue was rather good. 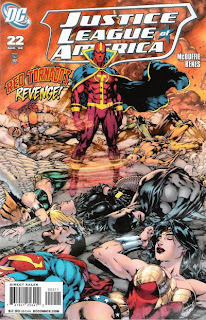 I am happy to find Red Tornado leaving the team as I never really grew fond of the character. Also, Anansi seems like a great villain for the league to face. I like how he speaks and how he spins the webs of stories. I look forward to the next issue. 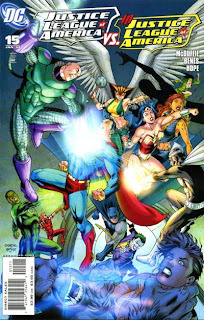 Now this alternate reality issue of JLA is one of the best issues of McDuffie’s run. He can write some great stuff when he isn’t editorially mandated to do things. There were so many great moments. The Brown Bomber! LMAO. It was refreshing to see Vixen calling upon Animal Powers again and I have to wonder if Meltzer only had it go away because he was too lazy to look up animals to use (:. But the anansi thing did seem to end rather quickly. 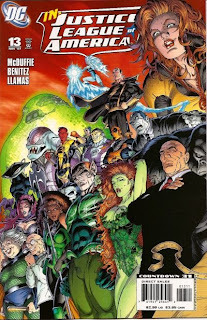 I bet McDuffie wanted it to be longer but then was told he had to do the whole Milestone crossover thing. Well at least this is a new arc I can look forward to, even if it is editorially mandated.